Nausea is a feeling of sickness in the stomach characterized by an urge or need to vomit (throw up). Nausea can be caused by a number of factors, including food poisoning, intestinal flu, exposure to radiation, ingestion of toxic substances (including alcohol), pregnancy, motion sickness, injury to the head, etc. Nausea is your body's way of telling you that it has detected something wrong. Vomiting is your body's natural mechanism for attempting to rid itself of a foreign substance that may have been ingested. Nausea and/or vomiting are just two possible symptoms of exposure to a hazardous chemical. But also remember that this symptom can arise from many other factors. If you suspect your nausea comes from chemical exposure, be sure to check the MSDS to see what other symptoms might also be reasonable to expect. If the nausea continues for a long period of time or is accompanied by other symptoms, consult your physician. 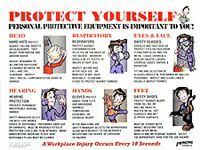 Training materials, handbooks, posters and videos at Safety Emporium can help your employees protect themselves from chemical hazards. Nausea & Vomiting, a great resource with info, prevention and treatment information at quickcare.org. Recommendations for evaluation and management of nausea and vomiting in early pregnancy by the U of Texas at Austin School of Nursing. Nausea, Vomiting, and Retching: Complex Problems in Palliative Care at the American Cancer Society. Nausea - Symptoms and Signs at MedicineNet. Motion Sickness at the NIH's MedLine Plus Encyclopedia.